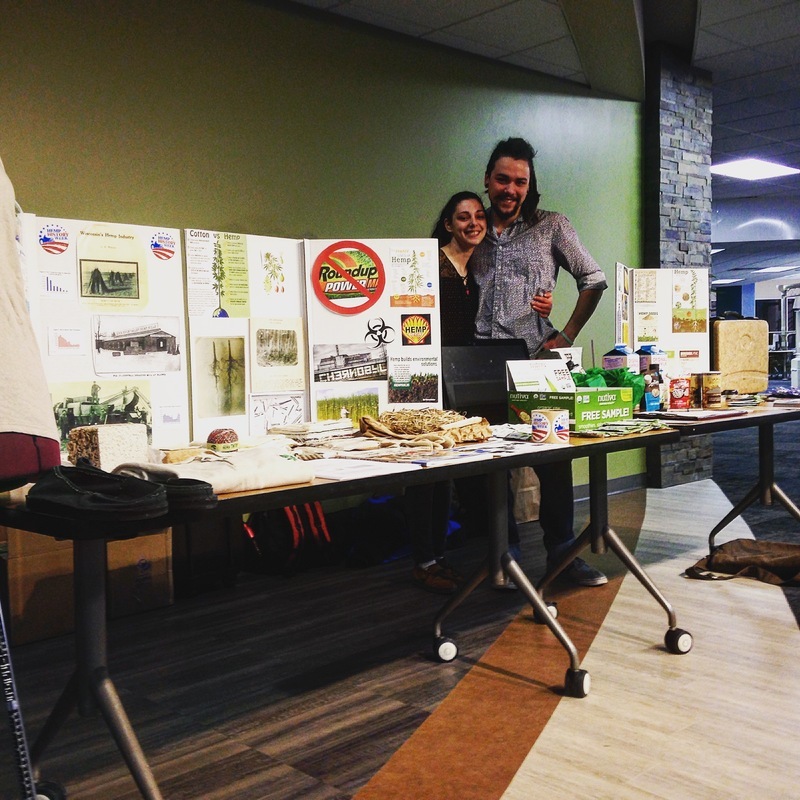 On March 29, 2017 Hempstead Project Heart (HPH) and Northeast Wisconsin Technical College's Sustainable Agriculture Club (NWTCSAC) held an informational table in the campus commons on Industrial Hemp. Hemp products littered the table with free samples from Dr. Bronners Soap Company and Nutiva Hemp seeds. Members of HPH and NWTCSAC spoke to the student population about the benefits of growing Industrial Hemp and using it as a rotational crop with clover, corn, and beans. Hemp would serve as the final crop to be planted for soil remediation and a cost effective no till method as the hemp roots grow deep. NWTC students also had the opportunity to take samples of Nutiva hemp seeds and put them in their smoothies. Hemp seeds are high in fiber and protein with all 20 amino acids as well as 9 essentials your body needs to be healthy. Not to mention hemp seeds are high in Omega 3's and 6's. Over 150 students took hemp seeds and added them to their smoothies with over 200 students stopping by the table to learn more about Industrial Hemp. The rich history of Wisconsin's Hemp Industry moved many students and even staff. NWTC's Administration were thrilled the Sustainable Agriculture Club promotes Industrial Hemp. One of their administrative officials came out to film a small segment about the benefits of growing Industrial Hemp. Marcus Grignon, Campaign Manager at Hempstead Project Heart spoke of the strength hemp hurd has to make building materials and even hemp pens. You can visit the video here to see. HPH's current endeavors involve working with the Sustainable Agriculture Club and NWTC Administration to post short films about the different products and uses of hemp.